You may have a loyalty program that rewards customers who perform certain activities enough times. This can be a good way to show your more active customers that you appreciate them, and also provides an incentive for those customers to keep coming back to advance within the program. Loyalty programs will of course be designed differently for any given company. For the purposes of this walkthrough, we will stay somewhat generic - to obtain each tier, customers will be required to create a certain amount of site content; we will call this site content "sets". Note: Zaius would know about the aforementioned site activity by receiving "set create" events. We will access this by utilizing a custom expression called "Set Create". Depending on how you design your Loyalty Program, you may need to utilize different expressions. Let's create the first segment - customers who are close to reaching Tier 2. These customers will have just created their 20th set. Navigate to the Customers page via the Customers option on the top navigation bar. Click the "+ Segment" button. Click the "Create a New Segment" button. Let's break down the above behavior step piece by piece. Everyone: We begin the segment without limiting it in any way. 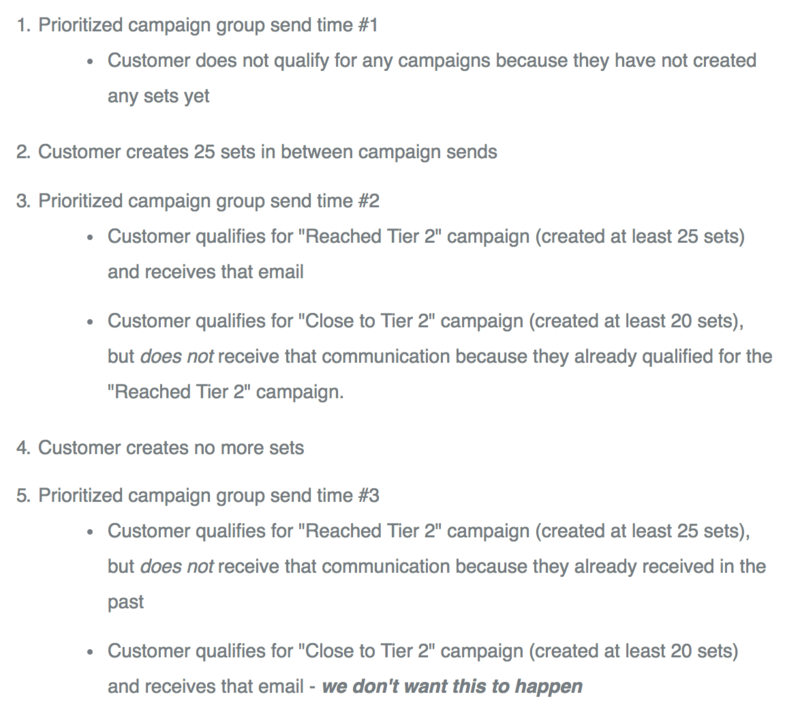 who matched: We want customers who did do this step that we are currently defining. Set Create: We want customers for whom we received an event that tells us they created a set. at least 20 times: We want customers who did this action at least 20 times. with same Event Type: We are requiring that the event types be the same for all events. This part of the sentence is required for other types of campaigns, but is redundant in our case. in the previous all time: We are not limiting the timeframe of this action. It is limited only by how far back Zaius has the necessary data. We can follow the same process as above to create our next 3 segments. Follow the instructions outlined in the Campaign Creation documentation to create and define a campaign for targeting your Loyalty Program customers. With the above setup, it would be possible for customers to fall into multiple segments. E.g., if they created 80 sets (close to Tier 1), they would also have created at least 25 sets (reached Tier 2), and they would also have created at least 20 sets (close to Tier 2). For this reason, we will create a prioritized campaign group that ensure customers receive the campaign that indicates the most progress within the loyalty program. We also want to ensure that a customer only receives any one of the above emails a single time. 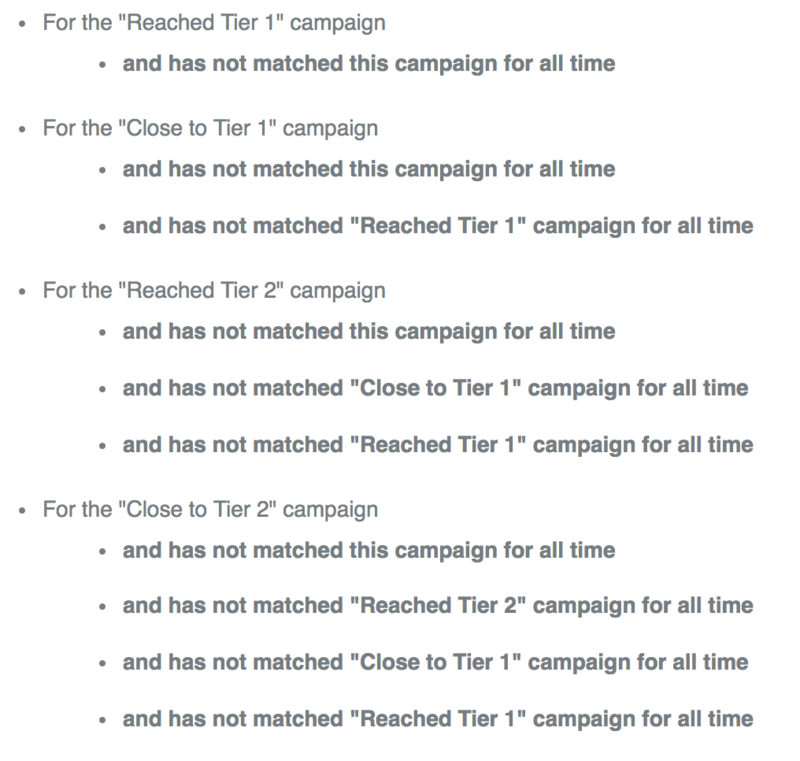 As such, we'll want to add a campaign constraint of "and have not matched this campaign in the last all time".